My baby brother is just finishing up his apprenticeship for becoming a camerman for the union in Toronto. He's worked on movie and television sets as well as commercials for the last year and a bit. As such, he's worked with some pretty big names. Now, I too have been on set before, as an extra during my first summer break in university (best summer job ever - I hardly had to do anything), and learned that most actors are kind of douchy. Most often, the character they play is nothing like them, so meeting the actor who plays a favourite character of mine is a total no-no. The last thing I want is to destroy the image I have of them in my head. 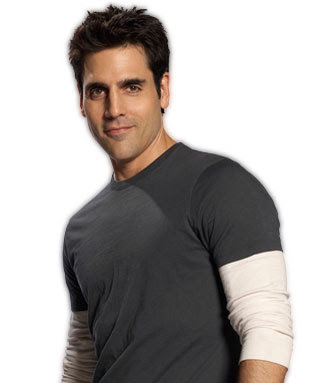 In the last few months, I've found that I've officially become obsessed with Rookie Blue's character: Sam Swarek. And by obsessed, I really do mean obsessed (but not in a scary stalker way...yet...I kid, I kid). Can you blame me, though, just LOOK at him! During the season finale, he got into quite a pickle and it was VERY INTENSE. In fact, there were times I feared he wouldn't survive. Naturally, during the commercials I drafted an equally intense letter to the writers, should Sam be killed off. Thankfully (for both myself and the Rookie Blue writing team) Sam lived to see the third season. He's got swagger, attitude and dedication to a high protein diet. Marc's aware of my tv-crush. I wouldn't say that he's 'psyched' about it, but Marc does appreciate that I'm obsessing about a dude who looks an awful lot like him (and just so we're clear, Marc also has a tv-girlfriend, so we're even). So what does that have to do with my baby brother? Well, this week he starts shooting the newest season of Rookie Blue!! Here's how I found out. It was a few weeks ago, when he came out to visit. (I'm slightly paraphrasing, of course). Me: So, now that you're done your apprenticeship, when the hell are you going to get on the set for Rookie Blue? BB: That's the strangest thing to say. Me: Why? Because I'm moderately obsessed with one of their main characters, Sam Swarek? BB: Um, no. I just got a call about it in the airport on my way here. Me: WHAT? Are you taking it? BB: Please stop screaming. We're in a car and it's important that you focus on the road and not kill us all on the highway. Me: ARE YOU TAKING IT? BB: I don't know...seriously, stop staring at me and watch where you're going. Me: Don't toy with me, baby brother. BB: Is it a good show? I haven't watched it. Me: Yeah, the show's great. Actually it's pretty fantastic. BB: Then maybe I'll do it. Me: Call them. Call them NOW and book it! Then you can meet Sam and tell me all about him. BB: I'm getting a little scared. You know he's not a real person, right? Me: You're getting caught up with the details here, baby brother. Call them. Book it. And then take some candid photos. And maybe Sam's cop uniform can get lost on the way to the cleaners (but only if it'd fit Marc, obviously). BB: You're legit freaking me out. You know I can't do any of those things. Me: Excuses, excuses. I'm more interested in results. BB: He's not real. I can't use my phone on set and I definitely can't steal anything. Me: Please shut your face and focus on your mission. So, although my baby brother ignored my texts yesterday for updates about what's happening with Sam-the-Sexpot, it makes me feel somewhat involved with the show...two degrees of separation is better than a million degrees of separation. There's also a small chance that I may have played my 'sick sister' card for the first time in four years. Now that's a smouldering stare. TriGirl - Fantastic idea!! FANTASTIC!